Can you become a graphic designer if you can’t draw? What are the main mistakes of a bad design? How to make your design stand out? How to come up with great color combinations? An interview with a graphic designer Carmia Cronjé. Special: How to create a unique design for an inspirational quote in 5 easy steps (tutorial). Today, I’m going to tell you a different kind of a story about following your dreams, which will give hope to many of you who are struggling to do the same. Carmia Cronjé studied web and graphic design in college. And although she always thought she would get an office job like everyone else, an idea of working for someone other than herself never felt right to her. So she decided to start her own freelance business. She had to learn a lot of things on the way and was close to giving up a couple of times, but she never stopped believing in herself and work hard. Four years later, Carmia is a self-employed graphic designer who has the luxury to work 35-40 hours a week from a desk in her bedroom and say “no” to projects she doesn’t feel passionate about. What, you don’t agree it’s a unique story? Ah, I know what you are thinking: Where’s the drama? No “I quit my well-payed job after 20 years”. No “I sold my kidney to invest in my business”. No “lucky encounter orchestrated by destiny”. A person knew what her passion was, went to college to study it, and then worked hard and refused to give up till it worked. Why do I think it’s an inspirational story? Because it shows everyone who neither wants to sell their body parts for seed money nor rely on “destiny and luck” that simply believing in yourself and working hard works, too. Meet Carmia Cronjé, a graphic designer from South Africa and an owner of Clementine Creative. Carmia doesn’t follow trends and prefers to make something unique from the heart, turning for inspiration to books, tea and penguins. At her young age, Carmia has extraordinary self-discipline. She works from 9 am to 5 pm five days a week from her (always very tidy) desk at home, makes sure she gets 8 hours of sleep every day, and leaves the weekends for relaxation only, staying away from her desk and emails. She is addicted to reading, loves animals, rainy days and computers. And although she calls her design style “whimsical and slightly feminine”, she doesn’t own a single pair of high heels, giving preference to sandals, jeans and hoodies. Carmia believes that to become a successful freelance graphic designer you need to be determined, and have ambition, faith and motivation. She is all those things, and much more – a manifold personality which comes to light in every piece of her work. I’ve been always interested in graphic design fascinated by the “magic” these people do to create stunning things. Besides, in the time of Canva, everyone feels like a graphic designer. And I’ve got Photoshop, a thing for designing infographics and images for my blog, and lots of questions! So prepare yourself for a 4000+ words article (as always). And, as always, I promise you it will be worth it. Gill: How did you get the idea to become a freelancer? Carmia: After I graduated, I discovered blogs and websites of the freelance designers, and some of them have already started freelancing while still attending university. I found it amazing that people hired them even if they have never met them before. I became increasingly interested in working for myself rather than for a boss. I did go for a few job interviews, but it just never felt right. I couldn’t picture myself having a 9 to 5 office job. Gill: How did you get the ball rolling? Carmia: I designed some print materials for my local school. Word got out that there was a graphic designer in town, and I soon found my first client. I went on to design his business’ logo, business cards, print materials, and much more. My home town is extremely small, so my client work dried up after a while. Around this time I started my own website and showcased my work on it. Gill: And there you were, a freelance graphic designer. Was it that easy? Carmia: Not quite. As naive as I was, I thought the work would come rolling in immediately. Not so. I didn’t know how to market myself to find new clients. I didn’t know anything about starting a business. This whole situation made me feel quite despondent, so I decided to start studying again – this time BA Communication Science through a distance learning university. My studies kept me busy, but when I had some free time I would keep reading articles about freelancing and improving my design skills by trying out different tutorials. When I finished my degree and finally had time to work on my business full-time, I decided to try out Elance – a website where freelancers can find work. As soon as I would complete a job there, I would write a case study about it on my blog. A few months later people would start finding my website through Google search and ask me to design something for them. This is where everything started. I later ditched Elance, because now I was getting all my clients through my blog. I’d like to be of service to women who are starting their own business, because I’m passionate about women entrepreneurship. Gill: Your website says you create brand identities for women entrepreneurs. Why specifically women entrepreneurs? Carmia: The reason is that I would like to be of service to women who are starting their own businesses because I am passionate about women entrepreneurship. I also feel that I get along with women and understand their needs better. Besides, my design style is whimsical and slightly feminine, so this fits better with women, too. Gill: We haven’t met before, but reading through your website as well as your interviews in the past gave me an impression that you are a very determined and hard-working person who knows what she wants. I also know that you work till 5 pm only and don’t check your emails on Sundays. Shouldn’t a designer be unorganized, messy and working at nights? Carmia: (laughs) That is certainly the stereotype. I am actually quite organised and like to have a routine and a structure to my day. I work best in the mornings and by the late afternoon I am completely useless. But inspiration does sometimes strike while I’m trying to fall asleep. Then I just write it down somewhere. I have to admit though, it’s hard to stay away from the internet. I still check social media and read online articles after 5 pm and on weekends, but I stay away from my email. It just creates stress for me when I would rather be relaxing. A good graphic designer is creative, attentive to detail, a good communicator, and eager to learn. Gill: Your father is a cartoonist and a math teacher – someone who is very creative and has a thing for logic, structure and numbers at the same time. I think you took after your father in this aspect. Do you sometimes feel that this inclination to logic and structure interferes with your ability to be creative, to let go and create something outstanding? If yes, how do you deal with that? Carmia: It’s funny how my brain works: I’m a designer, but I can’t really draw. And although I have the ability to think logically, I’m bad at math and numbers. I guess I got a watered down version of my father’s talents (laughs). I’m comfortable with coding (HTML and CSS), but I would be so bored if I had to code all day! I need to have that creative outlet. To answer your question, yes, I feel that my inclination to logic and structure interferes with my creativity. For example, when I’m designing a website (just the visual of it), I start to wonder how I’m going to be able to code it. So I feel that it inhibits me to create something outstanding. Strangely, sometimes I design stuff so “outstanding” that it just isn’t practical anymore, as if my creative side is rebelling against its logical counterpart. I wish there was a way to “switch off” that rational part of my brain temporarily so I can be more creative. I’ve read that practising meditation and mindfulness can boost your creativity. I’ve been trying it out for a month, so we’ll know soon enough if it works. Gill: Can you name some characteristics one should have to qualify at least for thinking about a career in graphic design? Carmia: I would say a good graphic designer should be creative, imaginative, attentive to detail, have good time management and communication skills, be responsible, professional, and an eager learner. Graphic Design is more about arranging text and graphics in a pleasing way that it is about drawing. Gill: Can I become a graphic designer with no ability to draw whatsoever or does one have to bring some natural talent to the table (or at least a parent-artist)? Carmia: I believe that one can become a graphic designer without knowing how to draw. If you look at some of the best logo designs, you will see that these designs consist of just basic shapes. It’s not really necessary to have drawing ability. This is what illustrators do, and you can always hire one or purchase some pre-made illustrations if you need to use a drawing in your design. Graphic Design is more about arranging text and graphics in a pleasing and interesting way than it is about drawing. Gill: I saw the amazing work you did for Greenvelope. It has a lot of graphic elements, like flowers, snowflakes, baloons, etc. So some drawing was involved. How does a graphic designer actually “draws” technically speaking? Which devices and software do you use? Carmia: Some drawings can be easily created using only basic shapes, like rectangles, lines and ellipses. These can be merged together or cut out of each other to create something new. For example, a key can easily be created using only the ellipse and rectangle tools. For drawings that cannot be created with these shapes, designers use the pen tool in Adobe Illustrator. It takes some time to get used to, but once you are comfortable with it, it is really easy to create shapes. Another tool that many illustrators and designers use is a drawing tablet. You can draw on it just like you would on paper, but instead, your drawing shows up on the screen. This tool is great if you want to use a free hand drawing in your design which will take too long to create using the pen tool. Since I don’t draw a lot, I don’t own one of these tablets. Create a unique design for your favorite inspirational quote in 5 easy steps. Gill: Prior to our interview I asked you if you could show us how to create a design for an inspiration quote. I know you’ve prepared a tutorial for it. Carmia: I did. 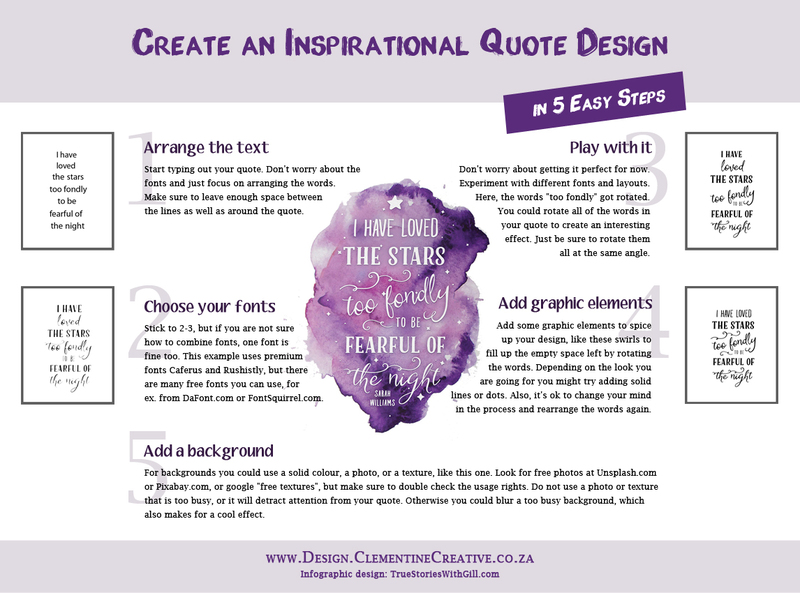 I’m going to show you now how to create a unique design for your favorite quote in 5 easy steps. 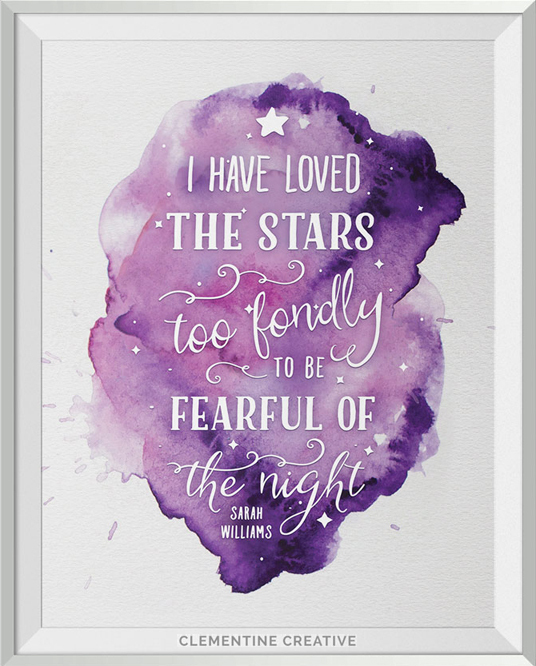 I chose a quote by Sarah Williams “I have loved the stars too fondly to be fearful of the night”, and used Adobe Illustrator, but you can use PicMonkey or Canva, which are free. Here’s how it’s done. Start typing out your quote. Don’t worry about the fonts and just focus on arranging the words. Make sure to leave enough space between the lines as well as around the text. Stick to two or three, but if you are not sure how to combine fonts, one font is fine too. This example uses Caferus and Rushistly, which are premium fonts, but there are many free fonts out there that you can use (check out DaFont.com and FontSquirrel.com). If you’re going for a fun, hand-drawn or chalkboard look, your design doesn’t have to be perfect. In fact, a hand-drawn look is all about imperfection! If you’re going for a more simple and modern look, you can use a simple font for the words. Don’t worry about getting it perfect for now. Experiment with different fonts and layouts. I decided to rotate the words “too fondly”. You could rotate all of the words in your quote to create an interesting effect. Just be sure to rotate them all at the same angle. I added some swirls to fill up the empty space left by rotating the words. But you don’t have to use swirls if that isn’t your thing. Swirls fit this design nicely because Rushistly is a swirly font. Depending on the look you are going for you might try adding solid lines or dots. 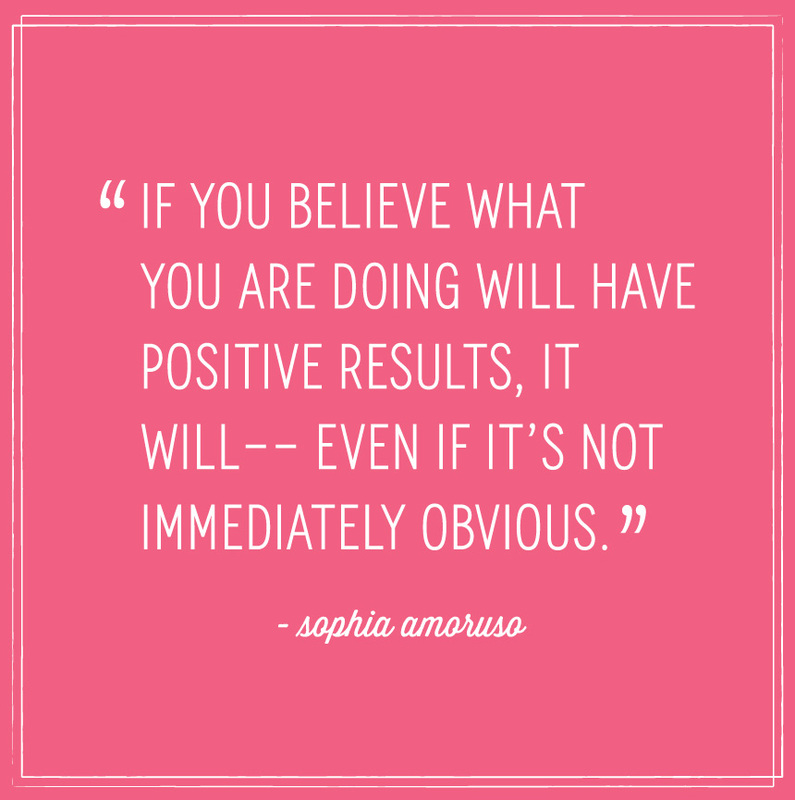 Also, it’s okay to change your mind during the process. I decided to put the words “I have loved” all on one line. For backgrounds you could use a solid color, a photo (look for free photos at Unsplash.com or Pixabay.com), or a texture, like this one. Just google “free textures” or “free clip art” (ideally, you will want to use something more specific like “free watercolor textures”), but make sure you double check the usage rights. In my design I used a premium watercolor texture, which you can find here. Be mindful not to use a photo or texture that is too busy, or it will detract attention from your quote. Otherwise you could blur a too busy background, which also makes for a cool effect. This is how the final version of my design looks like. You can get a printable for it here. 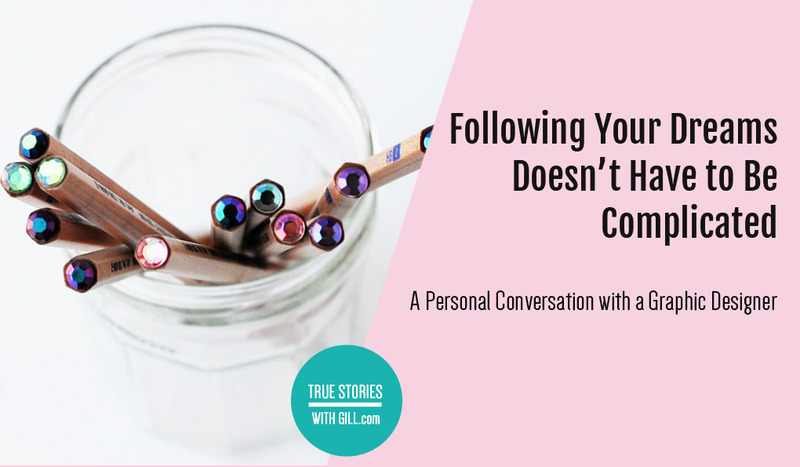 Gill: I noticed that on your blog you share a lot of printables – from motivational quotes to weekly planners and invitations. You even created a printables shop. How did you come up with this idea? Carmia: I have always loved stationery and used to create cards for my parents and friends when I was a child. When I started reading other blogs, I noticed that printables were very popular and decided to start designing them, too. At first I only shared free printables on my blog, but after many people complimented me on them I decided to start my own shop. It turned out to be an ideal way of passive income. Gill: One might think, “Why buy a printable? I’d rather download something free from Google image search or buy a ready-made product in my local store.” Is it actually worth the efforts? Carmia: To be honest, I had the same concerns, but people do buy them. I think it’s because premium printables are of better quality. Many free printables are designed by amateurs. Professional designers are more likely to sell printables, so you know you are getting a professionally designed piece when you buy their work. With regards to buying a physical product in a store: some people will always like ready-made stationery better, while others will enjoy printing it out themselves, maybe also adding a few embellishments, etc. They like the DIY aspect of it. Downloading a printable is also convenient when you don’t want to leave the house or you need something at the last minute, like a birthday card you forgot to buy, for instance. Main principles of graphic design? Balance, repetition and white space. Gill: I understand that nobody can become a designer within 10 minutes, even after going through your wonderful tutorial, but maybe you could give us a sneak peek into the world of principles of design. What would you say are three most important principles of graphic design? Carmia: I would say it’s balance, repetition and white space. A good design has balance, meaning the elements on the page aren’t all over the place, but are instead arranged in a way so that it balances out. Repetition means that you use the same or similar elements throughout your design. For example, decide on the fonts you want to use and stick to them; make all your headings in the same font, all of your paragraph text, etc. Also, there must be an ample amount of space between columns, between the edge of a picture and its text, between the margin of the page and its content, etc. Many are afraid of using white space thinking that the design will look empty, cramming it with as many elements as possible. White space isn’t empty space. It gives your design the necessary breathing room. Don’t make these mistakes when designing an image for your blog post. Gill: With Canva, everybody is a designer nowadays. They can’t all be good, though. What are the “no-go”s for a good graphic design? Not enough contrast between the text and the background. For example, green text on a red background. It makes your eyes hurt and it’s hard to read. It’s best to use dark text on a light background. Inappropriate fonts. For example, using Comic Sans in a professional document. Comic Sans isn’t a bad font, it’s just been overused and used inappropriately. If you have to use it, use it for something like a kids’ party. Decorative fonts as body copy. Decorative fonts (like script fonts) should be used in moderation. Use them as headings while using a plain font for body copy. Overuse of special effects. Using embossing, rainbow gradients, bevels, etc. trying to “beef up” a design. If a design is bad, it can’t be saved by special effects. Beveled buttons used to be cool, but it just looks dated now. Not enough white space. Make sure there is enough space between the elements on a page. For example, when text is contained in a box, make sure there is ample padding between the text and the box. Let the design breathe. Gill: This might seem like an odd question to you, but I’ve always wanted to ask this: How do you come up with color combinations? Do you use the “scientific method” (adjacent colors, triad, tetrad, etc.) or is it a designer gut that speaks from experience? Carmia: I think some people just have a talent to come up with color combinations, but you don’t necessarily have to be a designer or an artist to do the same. It can be time consuming to create your own color combinations, so designers sometimes utilise such tools as Adobe Color CC or Colour Lovers. Pinterest is another great source to find some color palettes. To stand out, be yourself, don’t follow the crowd and seek inspiration from places other than internet. Gill: The designer market is saturated. How can one stand out? Carmia: That’s true. Plus, these days anyone with Photoshop thinks they’re a designer. Given you’ve studied design or have learned its principles on your own, for your design to be unique, it has to reflect your personality, because there is no second person in the whole world who is exactly like you. I know everyone says that, but you have to be yourself. Don’t follow the crowd, and seek inspiration from places other than internet. Design stuff that makes you happy. If you are passionate about what you do, it will show in your work. Another thing that makes people notice you is using paid fonts in your designs. Free fonts are everywhere – although there are exceptions – and everyone uses them. Surprisingly enough, there are many new graphic designers who only use free fonts. It took me about 5 years before I purchased my first font, but by using premium fonts you’ll make your work stand out more. Gill: If I want to hire a designer what are the main questions I should ask and what answers should I expect? Carmia: Look at their portfolio first to determine if you have similar styles. If you’re looking for something ornate and decorative, a designer that specializes in simple and modern designs won’t be a good fit. Then, ask them to explain their process to you. If a designer doesn’t have a clear process outlined, that could be a bad sign. Someone who has a process looks professional showing that they have done this before. You should also ask them in what format they will deliver your final designs. If you’re getting a logo designed, you absolutely have to receive it in a vector format – this could be an AI or EPS file. If your designer is only giving you a JPEG or PNG, you won’t be able to resize it without losing quality. It’s also good to ask yourself whether you have the time to work with a designer. A designer will need you to be available to give feedback on drafts. If you don’t have enough time the project might drag on for months, and everyone will just lose the motivation to work on it. 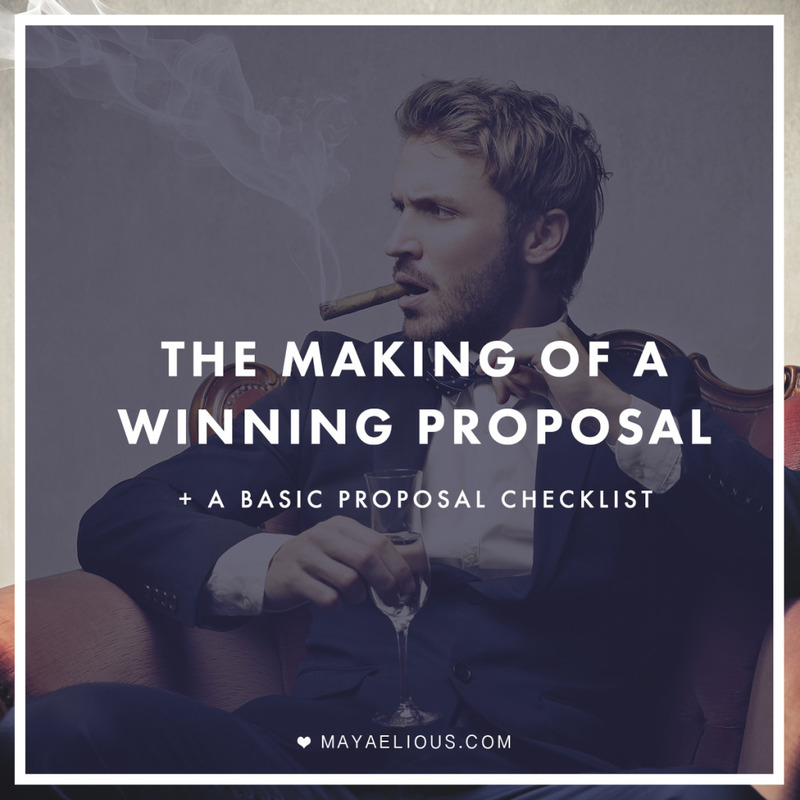 As a blogger, it’s not necessary to use images related to your niche to catch the reader’s eye. Gill: We have some questions from the audience, if you don’t mind. Arantxa asks: What would be a good picture to catch the eye of the reader in my business niche, which is weight loss management? I am tired of seeing pictures of fat people, food, measuring tape, a scale, etc. Can I use a picture unrelated to my niche to catch the interest of the reader and what is the best way to do it? Carmia: Hi Arantxa. You’re right, you don’t have to use photos related to your business. So instead of doing what everyone else in your niche is doing, you could use a solid color – anything bright that will catch the eye – as a background with a couple of lines of text. Or you could use a photo, something relaxing, like a nature scene, for example (check out unsplash.com or littlevisuals.co) and place a transparent layer on top of it. You can do this in PicMonkey. As for the font, I suggest to use something bold that will catch the eye. Something like Bebas Neue, Raleway, or Montserrat, for instance. Gill: Trudy asks: I’m setting up a web page to feature my photography. I like clean lines and a look that brings out the photos. What would you include on a web page intro? Also, I want to make an impact without too much distracting “clutter”. Is black a good background color to frame the images? Carmia: Hi Trudy. You are already on the right track. When people land on your page they will want to immediately see what it is that you do. So a profile shot, a couple of lines about what you do and whom you work with will be great. For the landing page, one photo that makes a big impact will be sufficient. You can always include more of your photos on your portfolio/gallery page. Be sure to have links to the other pages of your website on every page (at the top is best). Something like “Home”, “Portfolio”, “About”, “Contact” will be perfect. As for the color of the frames, black or white background will both look good, it’s up to you. Gill: Carmia, thank you so much for taking the time to answer all my (endless) questions! It was a pleasure talking to you. I wish you and Clementine Creative all the best. And I’m sure we’ll meet again, as I’m planing on stalking your blog for more tutorials, tips on design, freebies, most importantly, and inspiration. If you are interested to learn more about Carmia and the work she does, check out other articles she’s been featured in on CleverBirdBanter.com, SheOwnsIt.com, HelloKaiCreative.com and BecomingYou.co.za. I publish a True Story once in 3-4 weeks. Like what you read? Want to ask my guests questions yourself? Subscribe! Previous post How to Become a Freelance Writer. A Story of One Career. Next post 7 Simple Ways to Spot a Liar. Intelligence Consultant Reveals His Secrets. Awesome artice! Really interesting to read. I really love Carmia’s work, her personality shines through every design. Thank you for stopping be, Nkhensani! As you can see, my introduction was also inspired by the interview you did with Carmia 🙂 I’m glad you enjoyed this interview. oh how inspiring! This is such a fresh perspective – thanks for sharing your story with us Carmia and THANK YOU Gill for bringing to us in your special way!! Hi Carmia! Thanks for the tips to create images for my post. Your suggestions are really interesting and I am planning to use them very soon. I love your work! Hi Gill, Thanks so much for the interview an for taking the time and effort to share great people and information with us. Thanks so much for your comments, Nkhensani, Heather, and Arantxa!